I got the most amazing nights sleep last night, my head hit the pillow I turned over and I was asleep. I love when that happens! I think there are times when I underestimate a good nights sleep; today is not one of those times. I do not always get a great nights sleep, when I do it is thoroughly appreciated. Yesterday I took my run back to the gym and finished a 5K on the treadmill in 39:39 or roughly a 12:45 mile. Best to date! I went home excited and happy about this accomplishment. Between my satisfaction with this and being tired from the physical exertion, my body gave me no choice but to have a good nights sleep. This is one more reason to continue to get physically and mentally fit, if I am happy and content at the end of the day, and my body is satisfied with the attention I paid to it that day I will fall asleep without all that doubt, self talk and worrying. Seems so simple and makes so much sense, really because it is simple we just make things complicated. 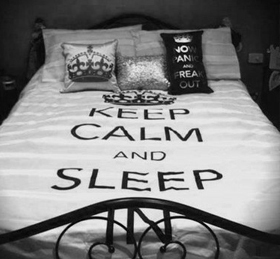 Satisfy your mind and body today and have an amazing nights sleep tonight! 166 days smoke free, 42 pounds down and 183 more nights sleep before the Disney Princess Half Marathon. Posted on August 22, 2012 by elizagal •	This entry was posted in Health, Motivation, The Journey, Weight Loss and tagged Health, lifetime journey, mental-health, running, Sleep, Weight loss. Bookmark the permalink.